The San Diego Trolley's new route would reach the UC San Diego campus by the 2015-16 academic year. The trolley could follow one of three routes. Click on the image to download a PDF of the whole route. In just five years, UC San Diego commuters may be able to ride the San Diego Trolley to campus from all over the county. But first, the San Diego Association of Governments, known as SANDAG, wants input on three different routes the trolley could take. After public comments, SANDAG’s board of directors will pick a route this summer. If all goes well, the trolley would come to campus during the 2015-16 school year. The trolley now extends from the border and East County to Old Town. The new route would add 11 miles to San Diego’s light rail system along the Interstate 5 corridor, with new stops in the Linda Vista, Clairemont, UC San Diego and University City areas. SANDAG officials held a meeting on campus last week to seek input on the project. The trolley would stop in Linda Vista at Tecolote Road and in Clairemont at Clairemont Drive and Balboa Avenue. After Highway 52, the proposed route splits into three alternatives. 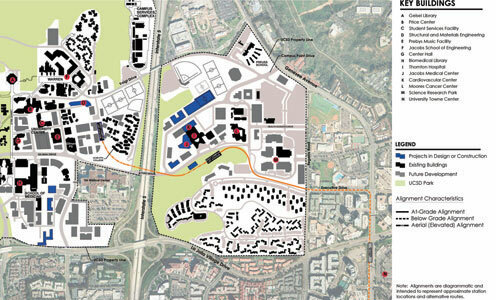 Two would enter the campus from the west and include stops on Nobel Drive. Another would enter the campus from the east, along Genesee Avenue and Executive Drive. 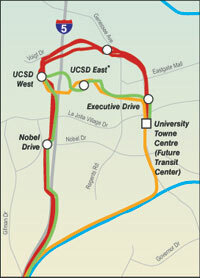 All routes include two stops for UCSD: one on the west side of campus and another on the east side. The route’s transit center would be located at the University Towne Center mall. 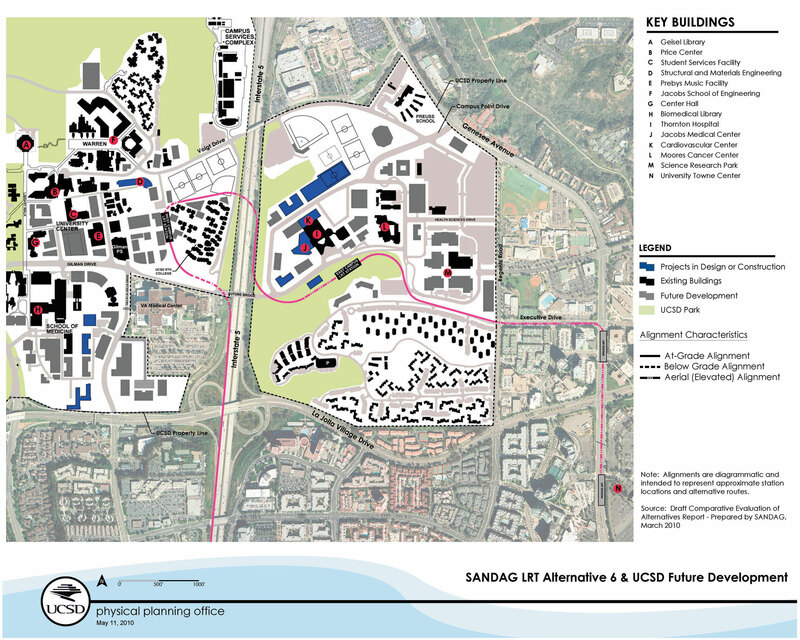 Campus officials said they plan to send a letter to SANDAG expressing their support of the project and giving feedback on the proposed routes. The project comes with a $1.2 billion price tag. Half of the money will come from a half-cent sales tax approved by voters in 1987. To finance the other half, SANDAG plans to apply for funds from the Federal Transit Administration, said Anne Steinberger, SANDAG’s public involvement manager for the project. 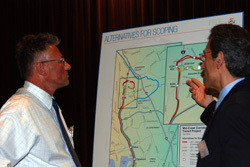 Brian Gregory, assistant vice chancellor for strategic campus resource initiatives, left, discusses proposed routes. Bringing the trolley to UCSD will provide greater access to the campus for the San Diego community, said Gary Matthews, vice chancellor of resource management and planning. It also will reduce the campus’ carbon footprint, by encouraging members of the UCSD community to get out of their cars, he said. “I am really excited about this opportunity,” Matthews said. Students will be able to easily go downtown, said Brad Werdick, the UCSD's director of physical planning. They will also have more options when deciding where they want to live, Vice Chancellor Matthews pointed out. That is also true of staff members and faculty, who may choose to live within walking or biking distance of a trolley station, said Werdick. Projections show that the project would generate 20,000 more riders a day for the San Diego Trolley system, Steinberger said. Brian d’Autremont, UCSD’s director of Transportation Services, said he expects 3,000 members of the campus community to turn in their parking permits once the trolley reaches the university. When the trolley began serving San Diego State University, the number of public transit passes at the school went up from 800 to 5,000, Steinberger said. A conceptual drawing of the Pepper Canyon station. During Wednesday’s meeting, several students and community members said they were looking forward to the trolley reaching UCSD. Bringing the trolley to campus will not only connect UCSD to the rest of the community, it will also be a great boost for sustainability, said Chris Westling, a history and international relations major. He doesn’t own a car and gets to classes by using UCSD’s shuttle. The trolley would allow him to be much more mobile, he said. “This is great,” he said. The Associated Students has repeatedly passed resolutions in support of bringing light rail to campus, in 1987, 1997 and 2003, said Westling, who is UCSD’s student representative on SANDAG’s working group for the project. Sharon Russakoff, a retired UCSD staff member who can’t drive anymore, said using public transportation now often means it takes her an hour to reach a destination that can be reached in 15 minutes by car. Russakoff, who lives in University City, said she believes the trolley will allow her to save a tremendous amount of time. “This will be wonderful,” she said. The trolley will bring great benefits no matter the route, said Brian Gregory, assistant vice chancellor for strategic campus resource initiatives. But all three routes have pros and cons, he added. The first proposal, endorsed last week by the Metropolitan Transit System board, would enter the campus from I-5, with a stop at Pepper Canyon Hall. From there, the route diverges into three alternatives. Two follow Voigt Drive, either at ground level or as an aerial track, and include a station near The Preuss School before joining with Genesee Avenue. A third alternative would avoid Voigt, take a sharp turn along Sixth College, cross I-5 and emerge behind the baseball field before merging with Genesee. This route also would include a stop near Preuss. Building a route along Voigt Drive could prove tricky, Gregory said. Having a station near the Preuss School could also come with safety issues. Another route that would come up I-5 also includes a station at Pepper Canyon Hall. But that route then makes a sharp loop around Sixth College, crosses I-5 again and reaches the East Campus, with a stop near the Thornton Medical Center. It then continues along the Mesa graduate student apartments to Executive Drive and then on to the UTC shopping center. That proposal has the advantage of avoiding Voigt Drive, which is both busy and narrow, Gregory said. But the sharp turn might wear out the trolley faster. Also, putting the east campus station at the medical center makes it more difficult for community members who would like to use the trolley to access Scripps Memorial Hospital or Preuss, he said. Another proposed route would enter the campus from Genesee Avenue, through Executive Drive, with a stop near the medical center. It would then cross a bridge atop I-5 then enter the west campus through Rose Canyon, with a final stop at Pepper Canyon. This proposal has been criticized by several groups for the environmental impact it would have on Rose Canyon. It also wouldn’t include a station at Nobel Drive, an area where many students live, Gregory said. But it is the quietest way to enter campus, he also pointed out. One proposed route would run along Interstate 5, Voigt Drive or further south, then along Genesee Avenue. Another proposed route would make a loop around Sixth College before going on to the UCSD Medical Center and joining with Executive Drive. A third proposed route would enter the campus from the east, along Genessee Avenue, Executive Drive, through the medical center, then Rose Canyon. Subscribe to This Week @ UCSD.